This entry was posted in Managing risks & hazards on 2017/08/16 by Susan. 2017 marks the 100-year anniversary of B.C.’s workers’ compensation system. 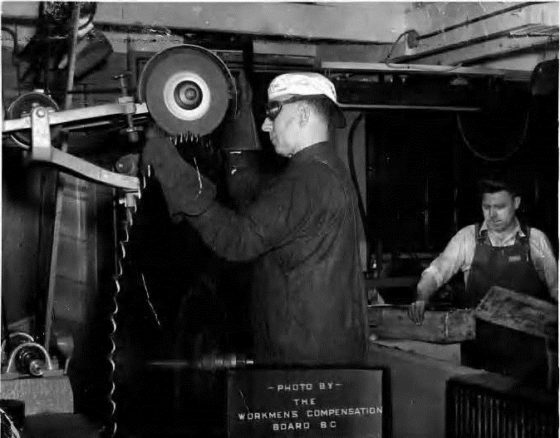 New videos share highlights of WorkSafeBC’s past 100 years. This is a milestone year for WorkSafeBC, the organization that sponsors this blog. Over the past 100 years, the workers’ compensation system has evolved in many ways. To learn more about its rich history, you can watch two new videos (with more to come) that share highlights of the last century. Each video is about 12 minutes long. I suggest you watch them both to get the full story. For now, here’s a few (of many) highlights that stood out for me. B.C.’s Workmen’s Compensation Act was passed in 1902, but did not come into force until January 1, 1917. That’s when the Workmen’s Compensation Board – known today as WorkSafeBC – was created. A worker filed the first claim on January 2, 1917. Thomas Pickering, new to his job as a longshoreman, was unloading farm equipment from freight cars. He tripped, fell, and crushed his finger, then missed 35 days of work. As a result, WorkSafeBC awarded him their first-ever time-loss payment, which was $32.73. In 1919, all businesses with more than 10 workers were required to have a first aid kit. From 1917 to 1928, there were 2,670 workplace fatalities and 282,000 injuries. In 1944, health and safety committees in B.C. starting including an equal amount of people from management and labour. This requirement marked the beginning of formalized joint health and safety committees. In 1955, fishermen were offered optional coverage for the first time. In 1959, Beatrice Zucco, the widow of a miner, received $13,000 in compensation. Previously, her claim had been denied. The claim was for her husband’s silicosis, which didn’t show up on X-rays. She and her children protested against the decision and drew attention from the media. Eventually, doctors determined the silicosis had been over-shadowed by tuberculosis.